Baron Adolf de Meyer’s name certainly comes first on any list of the great photographers of elegance and he is clearly recognized as the founder of modern day fashion photography. The place is his by right of a talent that transformed fashion photography into an art and is also his by age, since he was born in 1868, three years before Proust. Like Proust de Meyer was fascinated by high society, but whereas the novelist soon began to caricature the people who had once dazzled him, the photographer Baron Adolf de Meyer strove to endow his subjects with all the glamour that he could summon. De Meyer’s camera defined the beauty and elegance of the 1920’s. He helped to set the standard of taste for an entire era and, in the course of doing so, he succeeded in establishing the new genre of fashion photography that today still continues to feel his influence. Meyer was brought up in Paris by his mother. Sadly his father had died young, leaving a certain fortune. It is quite possible that the elder de Meyer had certain connections because since about 1895 the young Adolf was living in London and had already been introduced into the fashionable Jewish set which was a part of the social circle of the Prince of Wales. Once Adolf had gained entry into the royal circle and had become a veritable court artist, de Meyer managed to photograph the Prince of Wales who by this time had become King Edward VII and his family. De Meyer in a most flattering way succeeded in photographing the royal family who appeared both majestic and agreeable. In 1914 de Meyer first appeared in New York, driven from Europe by the impending drumbeat of war and the ensuing demise of the fashionable world that was necessary to him as a livelihood. Eccentric, poseur, boulevardier incarnate, this brilliant and curious person was the embodiment of the Belle Époque era that had seen him rise from obscurity, marry a great beauty, and achieve a formidable reputation as a gentleman photographer. 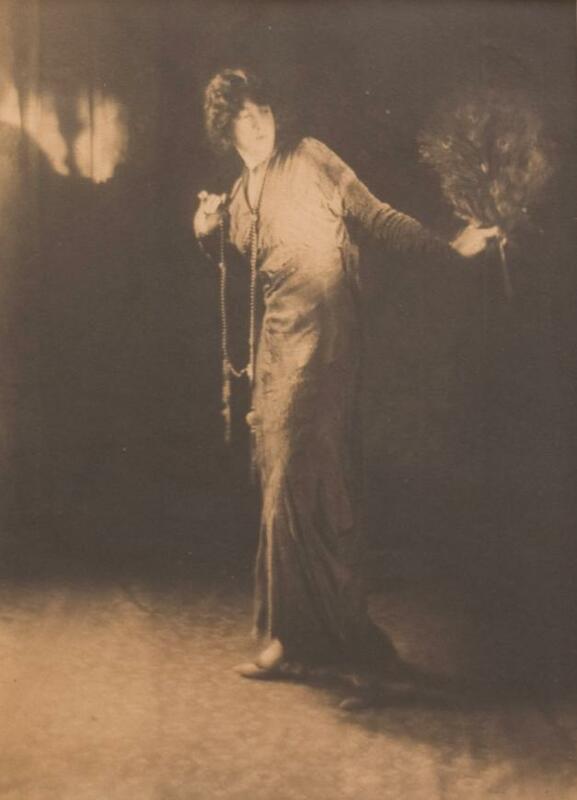 The fame of his pictures steeped in the aesthetic of his time – the society portraits of Lady Ottoline Morrell, Mrs. Lydig, and Edward VII, along with his unsurpassed photographs of Nijinsky dancing- preceded him to America. With no other means of support de Meyer became a professional photographer. He possesses all the ingredients of a great photographer - technical ingenuity, enormous patience, flair, and above all an incomparable eye and instinct for the truly chic. Within weeks the international magazine Condé Nast had hired him. For more than a decade, first for Vogue and later for Harper’s Bazaar, de Meyer’s camera served as both the arbiter of elegance and its celebrant. His style was so entirely distinctive that his bold signature was scarcely necessary to identify his work. In his lustrous images lives the essence of the flamboyant society that arose in the aftermath of the Great World War I. Both in these images and through them photography of high fashion, as we know it today, was born. Baron Adolf de Meyer, while still somewhat of an amateur photographer, was hired at Vogue in 1913 to give the still-small magazine a high-society profile. Previously Vogue had only reproduced illustrations of dresses. To effect this transformation at Vogue De Meyer photographed many actresses famous from the silver screen and a number of society figures and thus succeeded in creating the editorial fashion spread, as we know it today. In the late nineteenth and early twentieth centuries the lines between fashion photography, portraiture, and theater photography were often blurred. Employing professional models was largely eschewed in favor of using society celebrities to model. Consequently fashion photographs were strikingly similar to society portraits. In particular De Meyer took a number of photographs of Gertrude Vanderbilt Whitney for Vogue in various poses dressed in elegant costumes with exotic props over the course of several successive magazine shoots. In the course of these photography sessions Gertrude Vanderbilt Whitney essentially became one of de Meyer’s favorite muses. In a Portrait of Gertrude Vanderbilt Whitney the subject of Baron de Meyer’s photograph strikes a confident and self-assured, although playful pose. Against a background of shimmering and dramatic lighting this photograph portrays the portrait of a clearly very intelligent woman who was an American sculptor, art patron and collector and thus creates a mood that decidedly reflects this very same individuality as well as her sense of humor and grace. By descent to her grandson Whitney Tower, Jr.